iPad Mini Display Shoot Out: How Does It Stack Up? The iPad mini has finally arrived—Apple's much anticipated response to the incredibly successful 7-inch tablets pioneered by Amazon and Barnes & Noble, and more recently by Google with its Nexus 7. So far they are the only tablets that have made a dent in Apple's near monopoly on tablets. At first Apple declared them too small to be useful, but consumers clearly wanted something more portable than a full size 10-inch tablet, and also a lot less costly. Millions were sold—and that got Apple's attention. Over the past year there have been increasingly credible accounts of a small iPad prototype being developed by Apple, but there was no guarantee that it would turn into an actual product until Apple's official announcement. In a short period of time mini tablets have evolved into first tier products with excellent displays. It shows how demand can drive the state-of-the-art very quickly. Apple has made displays their most prominent marketing feature because they determine the quality of the visual experience for everything on a tablet or smartphone—including apps, web content, photos, videos, and its camera. So how good is the display on the iPad mini? And how does it compare to the displays on the leading Amazon Kindle Fire HD and Google Nexus 7 tablets? And how does it compare to the displays on the full size iPads? We'll tell you here. Dr. Raymond Soneira of DisplayMate Technologies has made it his mission to suss out the best smartphone, tablet, HDTV, and multimedia displays from the worst with his Display Technology Shoot-Out series. Here, the iPad mini, Kindle Fire HD and Nexus 7 fight. To evaluate and analyze the display on the iPad mini we ran our comprehensive series of Mobile Display Technology Shoot-Out tests and compared it to the Amazon Kindle Fire HD and Google Nexus 7, and also to the iPad 2 and new iPad 3. We take display quality very seriously and provide in-depth objective analysis of side-by-side comparisons based on detailed laboratory measurements and extensive viewing tests with both test patterns and test images. The discussions and analysis here deal primarily with the iPad mini. For parallel in-depth discussions and analysis of the Amazon Kindle Fire HD and Google Nexus 7 see our 7-Inch Tablet Display Technology Shoot-Out. Our iPad Display Technology Shoot-Out compares the iPad 2 and the new iPad 3. For earlier "popular" full size tablets see our 10-Inch Tablet Display Technology Shoot-Out. In this results section we provide highlights of the comprehensive lab measurements and extensive side-by-side visual comparisons using test photos, test images and test patterns that are presented in later sections. The Comparison Table in the following section summarizes the lab measurements in the following categories: Screen Reflections, Brightness and Contrast, Colors and Intensities, Viewing Angles, Display Backlight Power Consumption, Running Time on Battery. You can also skip the Highlights and go directly to the Conclusions. Pixel resolution has been the number one topic of discussion for the iPad mini—both before and after launch. Many people were expecting a retina display like the new iPad 3, but that would have required a 326 pixels per inch display with more than four times the screen area of the iPhone 5. That is currently out of the question for both cost and manufacturing volume and yield since it would need to be low temperature polysilicon. Given that Apple has been sticking with either 1024x768 or 2048x1536 iPad displays for compatibility reasons, that meant the iPad mini had to be 1024x768 with 163 pixels per inch. But that's now considered to be rather on the low side. While screen resolution gets lots of attention from both consumers and marketers—it's really only critical for providing visually sharp text—but that applies for most applications running on a tablet. The $199 Amazon Kindle Fire HD and Google Nexus 7 both have considerably sharper displays with 216 pixels per inch, and they both delivered considerably sharper text. We'll discuss below how Apple can improve image sharpness on the mini iPad. The screens on almost all tablets and smartphones are mirrors good enough to use for personal grooming. Even in moderate ambient lighting the contrast and colors can noticeably degrade from ambient light reflected by the screen, especially objects like your face and any bright lighting behind you. So low reflectance is very important in determining real picture quality, especially on the smaller and more portable Tablets. The lower the better. This article shows how screen images degrade in bright ambient light. Screen reflectance on the iPad mini is a surprisingly high 9.0 percent. On the Nexus 7 the reflectance is a much lower 5.9 percent, while on the Kindle Fire HD it is 6.4 percent. As a result, the iPad mini reflects 53 percent more ambient light than the Nexus 7 and 41 percent more than the Kindle Fire HD. That's quite a big difference. Screen visibility and readability in high ambient light depends on both the maximum brightness and screen reflectance, which we evaluate with a contrast rating for high ambient light. On the Kindle Fire HD it is 58 percent higher than the iPad mini and 47 percent higher on the Nexus 7. While the display PPI and pixel resolution seem to get most of the attention, it is the display's color gamut together with the factory display calibration (below) that play the most important role in determining the wow factor and true picture quality and color accuracy of a display. The color gamut is the range of colors that a display can produce. If you want to see accurate colors in photos, videos, and all standard consumer content the display needs to closely match the standard color gamut that was used to produce the content, which is called sRGB / Rec.709. Most of the previous generations of LCD tablets and smartphones had smaller color gamuts around 60 percent of the standard gamut, which produces somewhat subdued colors. But that's been changing due to both technology and competition. While the iPad 2 and iPhone 4 had reduced 61-64 percent color gamuts, the Amazon Kindle Fire HD and Google Nexus 7 both deliver a much larger 86 percent color gamut, and the new iPad 3 and iPhone 5 have full 100 percent standard color gamuts. So it was a surprise and a major disappointment for the iPad mini to arrive with an antiquated smaller 62 percent color gamut. The raw LCD panel hardware first needs to be adjusted and calibrated at the factory with specialized firmware and software data that are downloaded into the device in order for the display to produce a usable image—let alone an accurate and beautiful one. This is actually a science but most manufacturers seem to treat it as if it were a modern art form, so few tablets, smartphones, and even HDTVs produce accurate high quality images. Apple has been a leader in accurate display calibration—the new iPad 3 and iPhone 5 have among the best and most accurate factory calibrations we have ever measured in a consumer product, including high-end HDTVs. The iPad mini follows that tradition—it has an accurate white point and a very accurate intensity scale, except for a 5 percent compression near the peak intensity, which we discuss in more detail below. Using our extensive library of challenging test and calibration photos, we compared the iPad mini to a calibrated professional studio monitor and to the new iPad 3, which has a virtually perfect factory calibration and color gamut. In spite of its smaller color gamut, the iPad mini delivered fairly accurate picture quality and color accuracy. This is due to color management processing that is generally absent from tablets and smartphones. However, the iPad mini display is still unable to produce very saturated colors, like fire engine red, which was not as vibrant and appeared with a noticeable shift towards orange. Very saturated purples are also especially difficult to reproduce on LCD displays with a reduced color gamut. For example, the iPad mini appeared almost identical to the iPad 2 in this screen shot comparing the latter to the new iPad 3. The iPad mini is certainly a very capable small tablet, but it does not follow in Apple's tradition of providing the best display, or at least a great display—it has just a very capable display. What's more, the displays on existing mini tablets from Amazon and Google outperform the iPad mini in most of our lab tests as documented below in the Shoot-Out comparison table. Some of this results from constraints within the iPad product line, and some to realistic constraints on display technology and costs, but much of it is due to a number of poor choices and compromises. Many people were expecting a retina display like the new iPad 3, but that would have required a 326 pixels per inch display with more than 4 times the screen area of the iPhone 5. That is currently out of the question for both cost and manufacturing volume and yield since it would need to be low temperature polysilicon. Given that Apple has been sticking with either 1024x768 or 2048x1536 iPad displays for compatibility reasons, that meant the iPad mini had to be 1024x768 with 163 pixels per inch. But that's now considered to be rather on the low side, especially given that the $199 Amazon Kindle Fire HD and Google Nexus 7 both have considerably sharper displays with 216 Pixels Per Inch. So Apple, the inventor of retina display marketing, now has a significant competitive shortfall on this very issue. Apple could have increased the iPad mini screen resolution in the same way as it did for the iPhone 5—simply having older Apps running letterboxed inside a higher resolution display, which would have been a great way to provide a higher pixels per inch display. iOS and newer apps would have used the full higher resolution—that didn't happen. While screen resolution gets lots of attention from both consumers and marketers—it's really only critical for providing visually sharp text—but that applies for most applications running on a tablet. As we have pointed out a number of times, the best way to increase visual text sharpness on any display is by using sub-pixel rendering, which Apple should now implement in order for the iPad mini to become competitive on visual sharpness. All of the iPads have a 4:3 aspect ratio screen, rather than the 16:10 or 16:9 aspect ratios found on most other tablets. One advantage of the iPad's more square 4:3 screen shape is that it lends itself better for use in both landscape and portrait viewing modes. Another is that a 4:3 screen is often better suited for reading because it has the same aspect ratio as content on 8.5x11 inch documents. But another major application for mini tablets is viewing widescreen video content with aspect ratios of 16:9 (and higher for many movies). On the iPad mini, 16:9 content is viewed letterboxed with only 1024x576 resolution, which is getting pretty close to standard definition video rather than true high definition 1280x720 video on most other mini tablets like the Amazon Kindle Fire HD and Google Nexus 7. A much better screen resolution choice for the iPad mini would have been 1280x960, because it could then deliver true HD video content, satisfactory letterboxing for older 1024x768 Apps, plus much sharper text for reading. The iPad mini is the most portable of the iPads so it will often be used under brighter ambient lighting than full sized tablets. As a result it's more important for the mini to have a low reflectance screen, otherwise reflections from the higher ambient lighting will reduce screen visibility and wash out the images and colors. Most displays are now coming with lower reflectance screens. The Amazon Kindle Fire HD and Google Nexus 7 managed to accomplish this, even at their low price points, but the iPad mini comes with an unusually high reflectance—it reflects 53 percent more ambient light than the Nexus 7 and 41 percent more than the Kindle Fire HD. This is another poor choice and another significant competitive shortfall. The previous generations of LCD tablet and smartphone displays had smaller color gamuts in order to improve their screen brightness, power efficiency, and battery running times. But that's been changing due to both technology and competition. Full standard color gamut displays not only deliver more accurate and vivid colors, but are better in high ambient lighting because the additional color saturation improves image contrast. While the iPad 2 and iPhone 4 had reduced 61-64 percent color gamuts the new iPad 3 and iPhone 5 have full 100 percent standard color gamuts. So it was a surprise and major disappointment for the iPad mini to arrive with an antiquated smaller 62 percent color gamut, especially considering that the Amazon Kindle Fire HD and Google Nexus 7 both managed to deliver considerably larger 86 percent color gamuts. That's another poor choice and another significant competitive shortfall. Mini Tablets fill an important need and will undoubtedly continue to grow in market share, so it's very important for manufacturers to understand how to optimize their smaller displays in brighter ambient lighting environments to deliver both top picture quality and long battery running time. See our new iPad 3 Shoot-Out Conclusion for a discussion of the many improvements that are needed for the next generation of both full size and mini tablet displays. 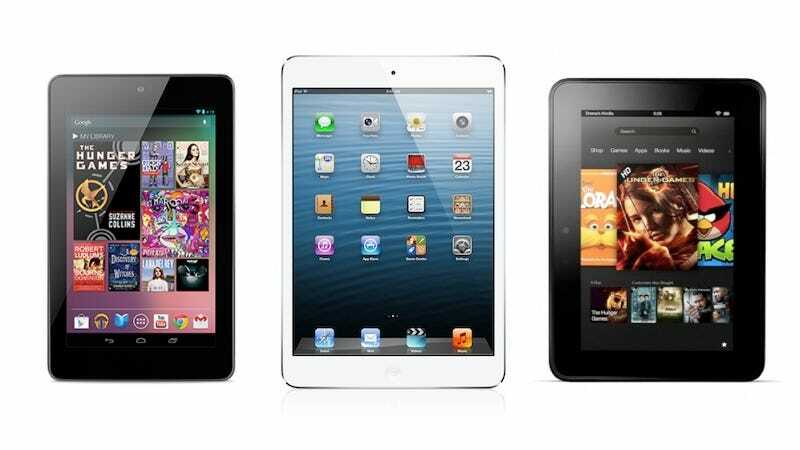 Below we compare the displays on the iPad mini, Amazon Kindle Fire HD, and Google Nexus 7 based on objective measurement data and criteria. Note that all of the tested tablets were purchased independently by DisplayMate Technologies through standard retail channels. For additional background and information see our 7 Inch Tablet Display Technology Shoot-Out that analyzes the Amazon Kindle Fire HD and Google Nexus 7 in depth, and the iPad Display Technology Shoot-Out that analyzes the iPad 2 and new iPad 3. For earlier "popular" full size tablets see our 10 Inch Tablet Display Technology Shoot-Out.